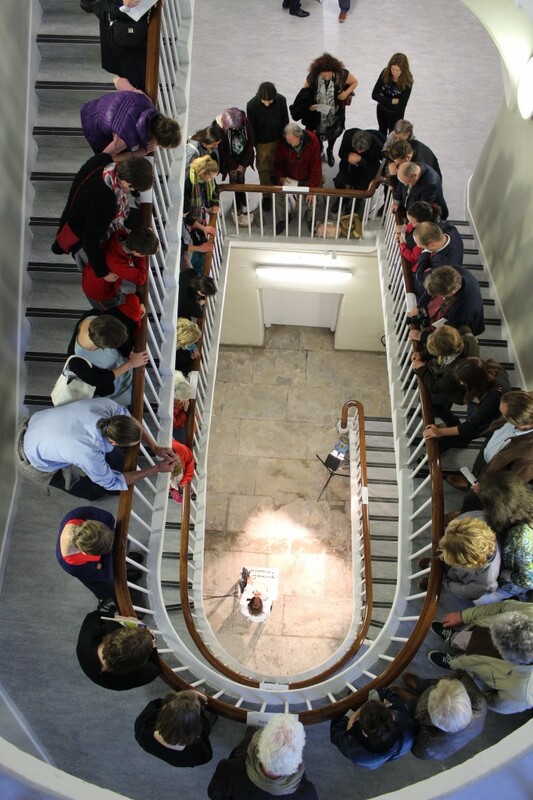 McDonnell’s context specific performance at Grangegorman coincides with the launch of ‘…the lives we live’ Grangegorman Public Art and Culture Night 2015. This twenty minute performance takes place in the basement of The Clock Tower consisting of one female performer – the audience is invited to engage with the performer and the history of the space. The Clock Tower is used to bring to mind all the years of incarceration, occupation, and abandonment Grangegorman has endured. The performer sits in front of dark cells hidden behind large green doors. ‘Breaking the Rule of Silence’ is to represent, not just the history of The Clock Tower, but, those manifold human experiences which seem to have left so little evidence on these stone and time worn walls. Much of the originality of McDonnell’s art comes from her use of performance, contributing to consequences and debate of political issues concerned with the female body and how the body can act as a political site of action. The origin of this work comes from exploring Grangegorman as a system of organised power and a containment structure against women, where they were subjected to enforced silence and labour. ‘Breaking the Rule of Silence’ is essentially site reactive. The performance is used to create a situation which may alter an audience’s perception about a place through a quality of observation, bringing small or hidden aspects regarding the history of the space. The performance is to portray the historical inequalities women have suffered within Grangegorman. The performance acts as a way of artificial rendering of the invisible and the voiceless, revealing the life of silence and the struggle of communication endured by incarcerated women. 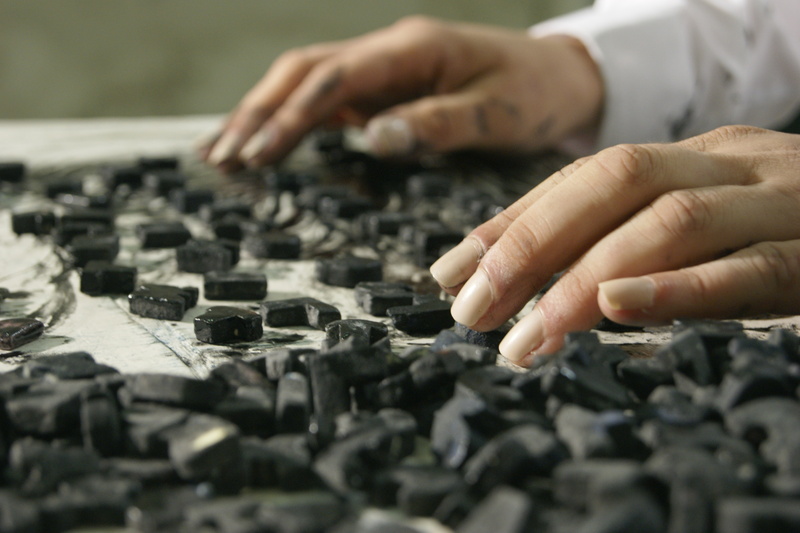 In ‘Breaking the Rule of Silence’ black ABC candy letters are placed on a small white table. A small table is used to explore restriction and confinement as choreographing boundaries and restriction are an important element throughout the work. The table is placed in a position which puts a clear distance between the audience and the performer. In the performance the movements are slow and deliberate as the letters are moved from left to right in an attempt to construct a sentence. The letters are then individually taken from the performer’s mouth. The movement of the mouth becomes fast and intense in the desperation and struggle to speak, only to reveal silence and black fluid which seeps from the female mouth. The piece ends when the performer has reached the end of the table, only to begin again, engaging in a constant repetitive struggle and action. Justine McDonnell uses performance and video to offer an unsettling, uneasy exploration regarding the inequalities women are subjected to within Irish society and institutions of incarceration. The unravelling of individual testimonies and a struggle for communication immerses the viewer in a challenging world posing aesthetic questions of human suffering, identity, acceptance, tolerance and the disruption of language. Her work transforms the memories of oppression, shame and humiliation into actions where the female body is a site of endurance and struggle against dominant ideologies. Justine McDonnell is interested in how stories of trauma may be constructed and encountered within the context of contemporary art. She is interested in developing contextual relationships that ‘the body’ may have with different kinds of objects, media and materials as she progresses with her practice. Throughout the use of performance, loss of identity, communication, restriction, vulnerability, confinement, struggle and betrayal of the female body is explored. Inspired by the experimental nature of Samuel Beckett’s theatre works, Justine invites the viewer to engage theatrically with the work, extending the perspective that perhaps the cinematic or theatrical offering alone cannot. Born in Dublin in 1992 Justine McDonnell studied at the Dublin Institute of Technology. She has taken part in a number of exhibitions including LIFT OFF, DIT; Bundles of Mysteries, Dublin; Amanda Coogan’s ‘Smoking in Bolero’, Live Collision, Project Arts Centre and DIT’s Broadcast Gallery. Curatorial experience includes ‘An Exercise in Seeing’ by Codagh Emoe, DIT, Dublin.